Note from me: For faithful readers who may have been wondering what I’ve been up to, when not writing for The Grand Rapids Press/MLive, here you go. I am one of five reporters for School News Network, which covers the students and teachers of Kent County public schools, and the magic they create in classrooms. Here is one of the more memorable students I’ve met. Like so many others, she inspires me with her courage and singularity of purpose. You might be surprised how many students like her are out there. I invite you to read about this remarkable young woman, and the many other students who give me great hope for the future. What a night it was. Cascades of glittering lights. Gorgeous gowns and snappy suits. Fine sculpted centerpieces on the tables. And two talented teens dancing elegantly as more than 200 guests watched. 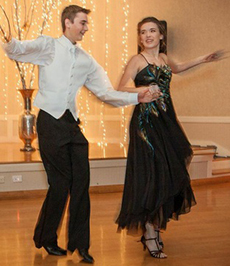 The teens were Alicia Monteith and her brother, Alex, who are accomplished ballroom dancers. Alicia had organized this benefit event, called the Inspire Ball, in a beautiful banquet hall last November. The reason was simple but powerful: to help others who had endured sexual assault, as she had. The ball raised more than $9,000 for the Children’s Assessment Center, a nonprofit agency that helped Alicia recover from being assaulted when she was 11 and to prosecute her abuser. With the ball and her previous benefit efforts, the Northview High School senior has raised $55,000 for the center’s work in helping child victims of sexual assault. From victim of a traumatic event, Alicia has grown into an articulate voice for other victims and an advocate for breaking the cycle of sexual abuse. The Inspire Ball was just the latest of Alicia’s fundraising efforts for the Children’s Assessment Center. Starting in July 2013 she began running in 5k races and soliciting sponsors. She quickly eclipsed her original goal of raising $1,000, the approximate cost of serving one child at the agency. By year’s end she had raised close to $14,000. Alicia has raised more funds for the CAC than any other individual, enabling it to provide a full range of services to 55 children, said Executive Directory Pam Doty-Nation. “We at the CAC are her biggest fans, not only because she has such a giving spirit but also the joy she brings as she thrives and grows beyond simply surviving,” Doty-Nation said. Alicia has appeared on Maranda’s TV show “Where You Live” and was interviewed for a Grand Rapids Press story. By speaking publicly about her assault, she encourages other young people to report theirs, said her former counselor at CAC. Northview High School Principal Mark Thomas said he admires Alicia’s forward-looking focus and her choice to be an advocate. But after confiding in another friend, Alicia was persuaded she needed to tell someone. After talking in vague terms to her mother, she was eventually referred to the Children’s Assessment Center. It was there she first told a detective the whole story. In nearly two years of counseling at the CAC, Alicia went from being a victim to a survivor. The center helped her the most simply by listening, she said. After graduating from the CAC program, she resolved to give something back for all it had done for her and her family. In July 2013 she sent out letters to more than 100 friends and family asking them to sponsor her in a run per month, hoping to raise $1,000 by December. She got more than twice that in two weeks. Further donations included an anonymous gift of $10,000, through a family friend who had been abused without telling for 40 years. Since Alicia began speaking and raising funds, several other abuse victims have confided in her including students. On a recent morning at school, a girl who was having problems with bullying gave Alicia a hug for helping her. “You’ll get through it,” Alicia told her. After graduating this spring, Alicia plans to study nonprofit leadership and psychology at Grand Valley State University. She wants to head an agency that provides “a safe haven” for abused children and adults. At the Inspire Ball, she told her story to the finely dressed guests. Her testimony was laced with biblical quotations, as when Jesus tells his followers that faith as small as a mustard seed can move mountains. Then, to the sound of a standing ovation, she rushed off to change into her dancing clothes. Want an inspiration to all of us — no matter what age we are. Bless you, sweet Alicia. God is truly working through you. You are very brave and so loved. Thank you, Deb. Your gracious spirit is appreciated, as always! Tears. Thank you for sharing this story on your blog, Charley. Thanks Charley, for sharng this beautiful story. Thanks so much, Carolyn. It’s good to know you’re reading these musings from the hinterland!